Petaluma Princess Party | Amazing Fairytale Parties | Moira D.
Princess Moira has been performing since a young age. 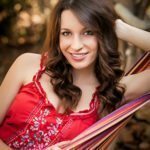 She’s been a professional swimming instructor for several years, and has years of experience in musical theatre and vocal performance. She is currently a full time student at UC Berkeley, pursuing a double major in Environmental Science and Legal Studies. Princess Moira is so excited to be apart of the Amazing Fairytale Parties team and to help make the kids’ dreams come true!